Supernatural brings back Rowena who tries to cheat death itself and Castiel learns just how bad things are for the Angels when he visits Heaven. Readers of this site will know that I’m always going to struggle with a Rowena episode simply because the character irritates me. Bringing her back at this point makes a lot of sense for the overall season arc because she is very powerful and can serve as an ally now and again; mostly when it suits her. The thinking behind getting her involved is sound. She could be a valuable resource in finding Gabriel who is required to open the portal back to the other world. Unfortunately Rowena is always difficult and is in the midst of her own plan. She is killing random people to lure Reapers so that she can kill them and get the attention of Billie aka Death. She is doing this to get Crowley back so the story here is about a mother consumed by grief and willing to do anything to get her son back. It’s a good starting point as it makes Rowena relatable to a certain extent. She may be a powerful amoral Witch with unpredictable allegiances but for the purposes of this episode she’s a woman in pain who can’t find an appropriate outlet for that pain. In the real world when someone dies then people have to grieve but ultimately move on with their own lives but in Supernatural there are options that let people cheat, overcome or reverse death. 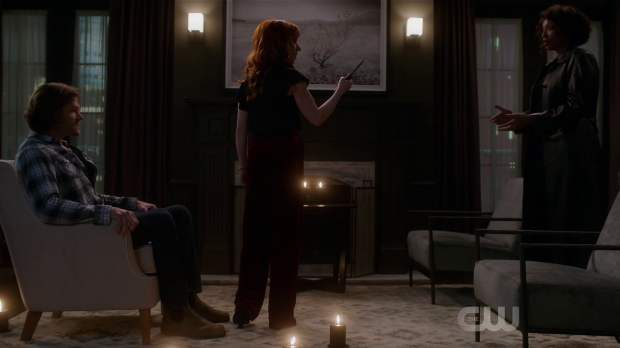 We’ve seen this time and time again so it makes sense that Rowena would assume that there is something she can do to bring Crowley back. The purpose of this story is to teach Rowena a lesson about how things really work. It’s all about grief and Rowena ends the episode accepting that Crowley is gone for good and there’s nothing she can do about it. It’s a powerful lesson and Ruth Connell plays it well. Her emotional arc takes her through the 5 stages of grief in this episode. 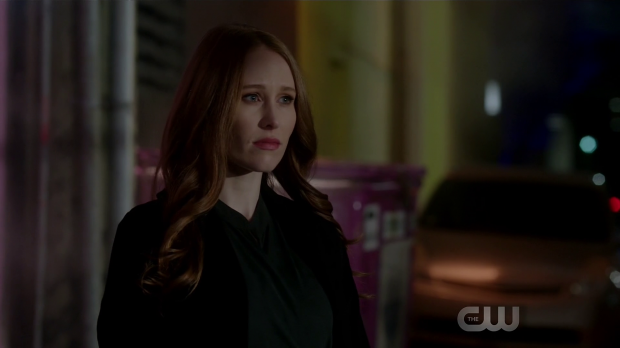 Denial comes from her assumption that she can force Death to return Crowley to her, anger is her general approach, bargaining comes into play when she tries to blackmail Billie, depression takes hold when Billie refuses to help her and acceptance comes at the end of the episode when she finally realises that her powers can’t always alter the natural order of things. It may seem rushed to work through all of these stages in a single episode but it more or less works because they are connected to Rowena’s plan. She moves onto the next stage when the next phase of her plan kicks in so it feels like a natural progression that comes to a satisfying conclusion. The scene where Billie shows up is the highlight of the episode. Everything about it properly conveys that the manifestation of a universal fact and a force of nature is in the room. Billie is a great character who steps into this role really well. Lisa Berry’s steady delivery with a hint of emotion is perfect in establishing that she’s not unsympathetic while still making it clear that there is nothing that she can do because the natural order is important. She gives Rowena important advice about life in general. It pretty much boils down to the fact that there will always be things out with her control and that loss is inevitable. This is something Rowena already knows and has been ignoring so hearing it from the manifestation of Death itself helps her realise that she can only hold off the inevitable for so long and that her ending is technically already written. Her actions in this episode do show that it is possible to change that but the message that Death eventually catches up with everyone is strong. Rowena’s acceptance of this comes with the apparent desire to be redeemed. It seems sincere enough especially considering her conversation with Sam during her last appearance but with Rowena nothing is ever certain. I wouldn’t be surprised if she was playing a long game of some sort, especially now that she knows Sam is the one who will kill her. Billie letting her in on that fact will likely prove to be a massive mistake on her part that may or may not negatively affect her. It will almost certainly negatively affect Sam and Dean. The final scene of the episode where Sam and Dean talk to Rowena about everything that has happened and encourage her to help them because it will help her in her quest for redemption is really strong. It’s well written, well acted and establishes Rowena’s role at least in the short term. Sam does say earlier in the episode that he’s ready to kill her should she step out of line and proves it when he does shoot her albeit with some hesitation so I suspect that a reckoning of some sort will come. I would actually prefer to see Rowena’s death be a sacrificial moment on her part where Sam has to facilitate it in some way. It would allow her some redemption and cap off their relationship in a meaningful way. Sam and Dean take something of a back seat in this episode. Their actions don’t really move the plot along in any significant way though this is very much Rowena’s story with Sam and Dean supporting that. For the most part their purpose is to be far enough behind Rowena to allow her time to act but let them catch up in time for them to react to it. 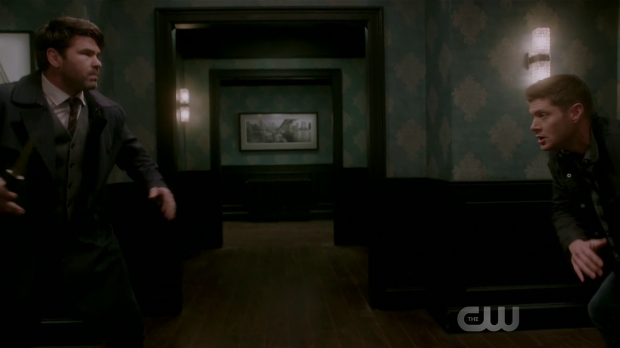 The episode does right by Rowena and Sam’s relationship and delivers a great Dean/bodyguard punch up. They also work with the Reaper Jessica (Kayla Stanton) in the sense that she turns up now and again to remind them that she can’t help. Her main purpose seems to be dropping exposition and allowing for the injection of some comedy into the episode. It’s all fine if a little unnecessary and it’s curious that the name Jessica doesn’t trigger Sam at all considering the memories that name must dredge up. In the search for allies Castiel goes back to Heaven to recruit the Angels to their cause because the best defence against an Angel army is another Angel army. It has been established that the Angel numbers have been dwindling rapidly over the past few seasons but this episode confirms just how bad it is. Naomi (Amanda Tapping) returns from the presumed dead to explain everything to him. The news is far more grim than anyone assumed as there are only 9 Angels in Heaven with 2 more on Earth. There may be more but only 11 living Angels are confirmed. They are facing extinction as a species which makes for a really depressing prospect. Heaven’s lights are shown to be flickering because it is powered by the rapidly decreasing Angel population. Cas doesn’t find out about Lucifer but this offers justification for why the Angels decide to follow him so easily since they have never been more desperate. In order to create new Angels they need an Archangel and Lucifer has promised to help them. They don’t yet know that Lucifer can’t do that but want to find Gabriel as another option. Angels being lost altogether has a significant consequence. No Angels means no Heaven which means no final resting place for everyone who has died in the entirety of Human history. The loss of Heaven would cause it to be emptied of all occupants and billions of Ghosts would be sent to Earth. The threat they represent would be unimaginable to the degree that it would change the world in really fundamental ways. It’s obviously a horrible prospect on its own but also firmly establishes that the death of all Angels will be a paradigm shift. The universe altering consequences of this are almost beside the point at this stage. It’s a very personal issue for Castiel who has to deal with being one of the last of his people. Misha Collins performs the reaction perfectly with a combination of shock and sorrow as he contemplates the implication of something that has been around since nearly the beginning of creation being lost. He has already had to deal with killing other Angels over the years which he made his peace with to some degree but having them go extinct is another thing entirely and it won’t be easy for him to process. There’s a lot of potential attached to this plot. I mentioned at the end of last season that Supernatural might be taking a more back to basics approach. Killing off the Angels would certainly be a definitive way to do that though I don’t think that’s what will happen here. The way I see it there are a number of options. It’s possible that lots of Angels will come through from the alternate universe and establish a foothold making them the definite villains once again. Another possibility is that Gabriel will return and help with the creation of new Angels. Jack could probably do this too and Lucifer might reclaim that ability eventually. God could also make a return appearance to restore Heaven to its former glory. There are no shortage of characters to help solve this problem though the solution would probably have far reaching conditions attached. The solution could also come from something introduced earlier in the season. Castiel found that he had been sent into emptiness which is where Angels go when they die. Cas could be resurrected so that means every dead Angel could come back as well. Jack, Lucifer or Gabriel could facilitate this. It’s also not impossible that Cas could find some way to access it since his memory of being there is relatively recent. It also feels appropriate to introduce something like that early in the season for it to pay off at the end. My prediction is that this is the most likely possibility with the Angels from the other universe crossing over to oppose them. A strong episode that plays around with some big ideas while telling a grounded character story. Rowena being taken through the five stages of grief is handled really well with the transition to each stage moving the plot along naturally. The appearance of Billie to tell her how life works and reaffirm the inevitability of death to her made for an excellent scene. Her apparent desire for redemption could be interesting because there is still the possibility she is playing the long game especially since she knows that Sam will be the cause of her death. I would like to see this end on a sacrificial moment facilitated by Sam as it would be an effective capper to that relationship. 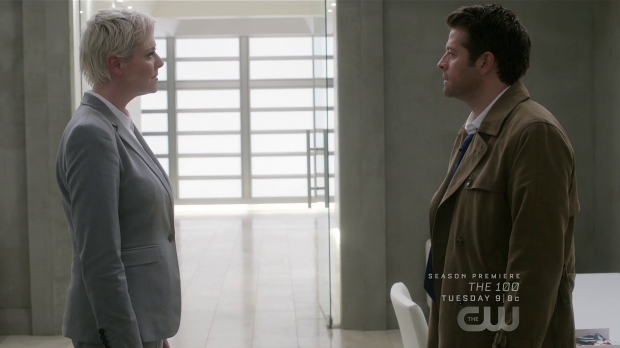 Castiel’s return to Heaven to recruit the Angels as allies clues him in on how bad things are in Heaven. He learns that there are only 11 confirmed living Angels which causes him to contemplate the implications of his people going extinct. The consequences are severe for Earth as it means that every soul in Heaven will fall back to Earth as a Ghost. There are a few possibilities to resolve this issue and I imagine most of them will come with conditions but the personal struggle for Castiel comes across well. 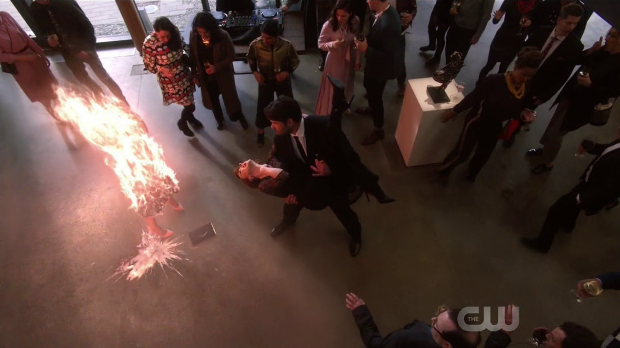 Misha Collins’s performance delivers the perfect combination of shock and sorrow to sell the moment. The possibilities brought on by this story are numerous and fascinating.